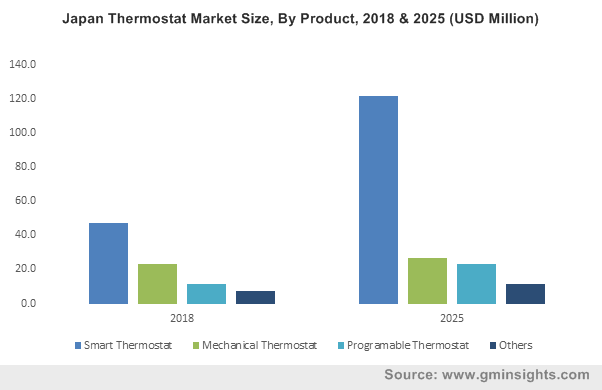 Thermostat Market size was valued over USD 3 billion in 2018 and is anticipated to exceed 65 million units by 2025. The shifting trend toward energy efficient technologies coupled with the increasing investment pertaining to smart home applications will foster the global market growth. Rapid development of urban areas & commercial buildings including residential complexes, hospitals, educational institutes and offices will positively impact the industry outlook. Furthermore, the increasing consumer awareness toward energy management systems along with the rising demand for sustainable heating & cooling technologies will stimulate the product deployment. Rapid technological advancements along with the development of IoT and home automation devices will stimulate the market share. Introduction of stringent regulations toward the development of sustainable building codes and standards will further boost the industry growth. In addition, the increasing infrastructure spending toward the refurbishment of residential establishments primarily across the developed nations will propel the product demand. The smart thermostat market is predicted to grow over 14% by 2025. Accelerating demand for energy efficient solutions along with surge in the sales of various smart home devices including Google Home and Amazon Echo will encourage the product adoption. Efficient energy savings, smart controlling and reduction in per unit energy cost are the some of the underline parameters which will foster the industry growth. Programmable thermostat industry is anticipated to grow as they are designed to adjust the temperature of the room based on the customer’s requirements. These devices reduce the energy losses from the heating and cooling systems by allowing the temperature difference to be reduced in times when the residence is unoccupied. However, high initial cost, difficult to use interface for programming and potential security risks limits the product demand. 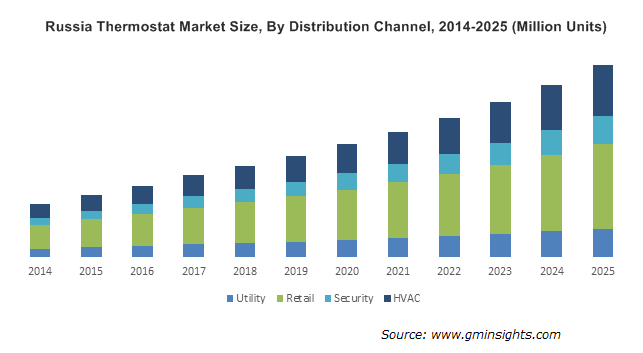 Retail distribution channel thermostat is anticipated to surpass USD 2.5 billion by 2025. The ongoing growth ventures by key industry players to enhance their presence across the globe has led to the amelioration in the product demand from retail stores. For instance, in October 2018, Johnson Controls acquired LUX Products Corporation to strengthen their portfolio in the consumer retail channel and offerings in thermostat. 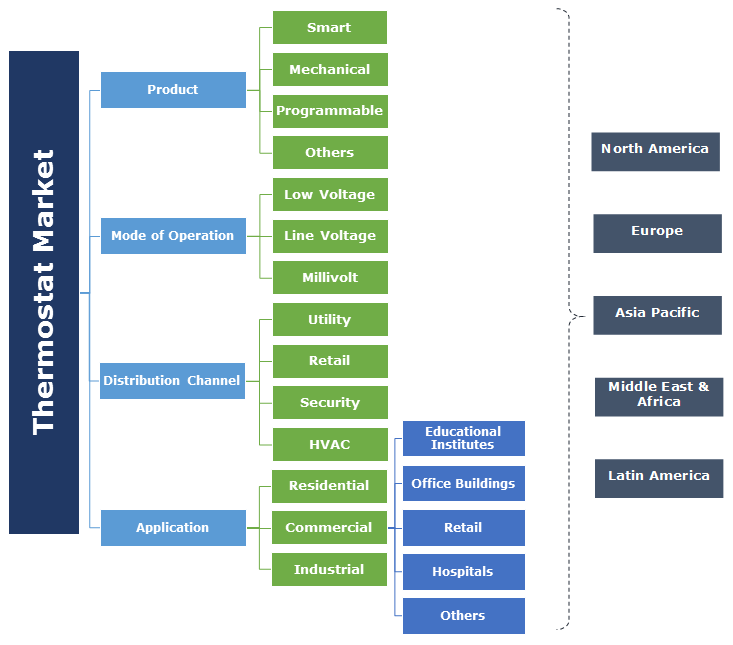 The increasing demand for heating and cooling technologies on account of torrid climatic conditions will foster the market through HVAC channel. Furthermore, the changing customer buying behavior along with the rising acceptance of advanced & IoT enabled solutions will enhance the product demand. The low voltage thermostat will onlook growth on account of ongoing technological innovations in the product design coupled with their increasing use as a temperature control solution across the residential establishments. Furthermore, the increasing investments toward retrofitting of existing buildings in order to comply with energy efficiency standards will augment the industry growth. Line voltage thermostat is anticipated to grow on account of increasing investments toward development of sustainable heating/cooling technologies. These devices are directly powered by 120-140 volt circuit and are widely used in electric resistance heating systems, baseboards and radiant systems. Paradigm shift toward the construction of sustainable buildings along with prevailing innovations in the design will positively enhance the business outlook. 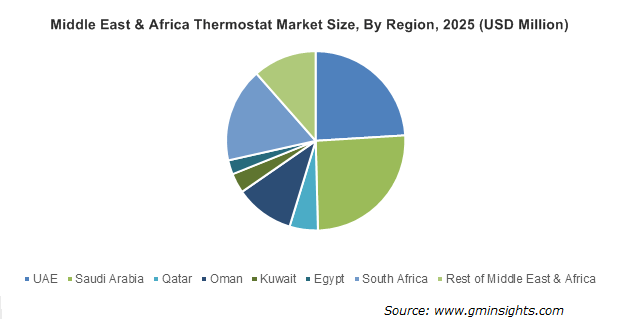 The residential thermostat was valued over USD 1.5 billion in 2018. Rapid urbanization and industrialisation across the emerging economies coupled with the development of small scale sustainable heating infrastructure will complement the business potential. Furthermore, increasing investments toward smart homes along with the introduction of stringent regulatory frameworks and government-assisted renewable norms will encourage the product deployment across the residential sector. Upsurge in deployment of the product across various industries including chemical, food and beverages on account of strengthening construction activities and increasing demand for IoT will boost the market across industrial sector. High return on investments, energy savings, compatibility with other devices in a smart ecosystem and declining prices are the some of the prominent factors which will thrust the product adoption. The U.S. market will onlook growth on account of increasing investments toward refurbishment of existing infrastructure along with the growing adoption of energy efficient devices across the region. As per IEA’s U.S. climate action plan directs to build safer, smart and stronger infrastructure to integrate climate risk-management considerations into programmes and planning. Eminent players operating across the global market include, Nest, Trane, Energate, Legrand, Alarm.com, Schneider, Nortek, RTCA, Computime, Johnson Controls, Danfoss, Carrier, ACDelco, Emerson, Vulcanic, Sensata, Trafag, Seitron, Venstar, Tado, Honeywell, Lennox, Ecobee, Centrica. The leading players across the industry are directing toward inorganic growth ventures to enhance their presence across the globe. In addition, focused R&D activities technological collaborations and product advancements have also been a key strategic implication for key players. The thermostat is an automatic device that regulates the cooling or heating of a substance in order to maintain it at a constant temperature. The product comprises of a temperature-sensing tool connected to a switching device. When the temperature reaches a desired level, the sensor switches the cooling or heating source on or off in accordance to a predetermined program. The product is primarily used for space-heating controls, in refrigerators and water heaters and are ideal for central heating, air conditioners & HVAC systems.